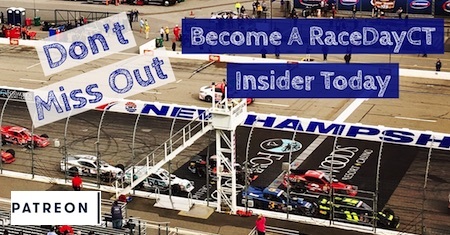 Looking to get the ride of a lifetime in 2019 at Stafford Motor Speedway? Well if you show up at the RaceDayCT Racing Season Kickoff Party on March 24 at the Four Seasons by the Lake in Stafford, you’ll have the opportunity to win that ride. All those in attendance at the RaceDayCT Kickoff Party will be entered to win a certificate for a Heat Race Hot Laps ride in the Stafford Speedway Two-Seater Modified. 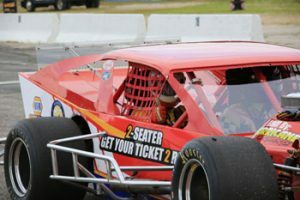 The Two-Seater Modified Ride Along prize was generously donated by Stafford Motor Speedway. So head to Four Seasons by the Lake on March 24. We’ll have the STP 500 Monster Energy Cup race from Martinsville Speedway on the big screens and as usual plenty of ticket giveaways and many more very special giveaways from all your favorite events and tracks and racing companies. More giveaways will be announced very soon. And we’ll have racing personalities on hand, food and drink special and the perfect party atmosphere. The party starts at 1 pm. And best of all, admission is free. Just come on down to have a great time with other local racing fans. To keep up with all the announcements, follow the RaceDayCT Racing Season Kickoff Party Event Page on Facebook. This is a great give-away!! If you haven’t done the ride-along yet put it in your to do list!! The car is a blast and to be in Bob’s company is iceing on the cake. Sitting in the stands having just endured a number of boring LM and LLM heats with few cars and the excitement is building to see the first SK Light heat. Then everything stops for the ride along car doing a few laps all by it’s lonesome. Not a fan. In an SK Light heat or feature……..that’s just fine. In fact worth a look back to see what mischief Bob Potter might be contemplating.